The Image Card content block allows you to add a single image with a caption against a solid-colored background. Drag and drop the block into your campaign or automation email, and use our different style options to customize it to fit the look of your campaign layout. In this article, you'll learn how to use the Image Card content block. The Content Manager supports JPG, JPE, JPEG, GIF, PNG, and BMP image files. To ensure your campaign displays as expected in recipients' inboxes, take a look at our image requirements. If you paste text from an outside source, like a website or word-processing program, use the Paste from Rich-Text tool to remove any leftover styles. If you don't want a background color behind your image, use an Image + Caption block instead. To include one or more images without captions, use an Image or Image Group block. To insert an Image Card content block, follow these steps. 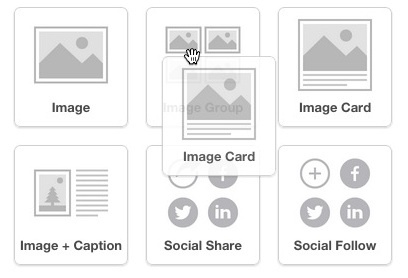 On the Design step, click and drag the Image Card content block into your campaign layout. Drag and drop an image from your computer into the Image Card content block. Or, click Browse to open the Content Manager and choose an image using one of the following options. After the image appears in the content block, click Save & Close. After you insert your Image Card content block and add your image, you can customize it to match your campaign design. To edit style and settings, follow these steps. In your campaign layout, click the Image Card content block you want to work with. 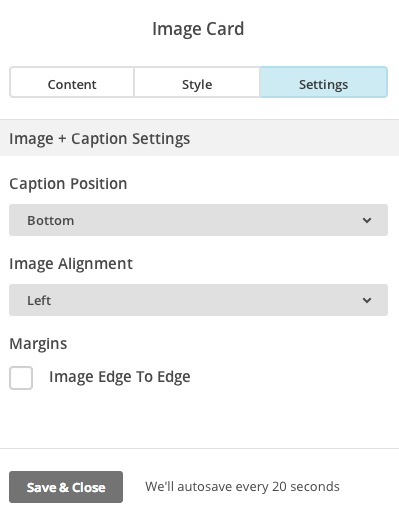 In the Content tab, type your text for the caption, and choose an image editing option. Choose a different image from the Content Manager. Modify the image in Photo Editor. Link the image to a website or a file for download. Add alt text to your image. In the Style tab, set your font styles, text alignment, spacing, background color, and border. Check the box next to Apply to all existing Image Card blocks to apply the settings to any other Image Card content blocks in your campaign. In the Settings tab, choose the position of the caption and the proportions and alignment of your image. 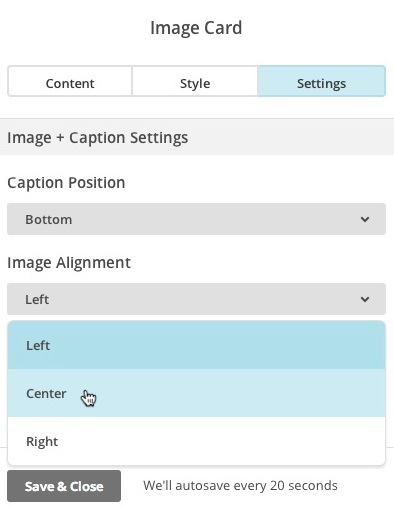 If you set the Caption Position to Left or Right, you can choose the caption width from the drop-down menu. Check the box next to Image Edge To Edge to proportionally expand the image to fill the content block. Return to the Content tab and use the editor toolbar to make any line-by-line style changes. After you're done, click Save & Close. 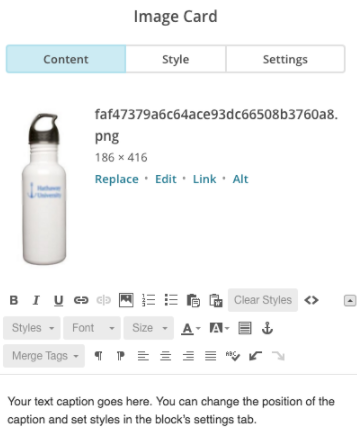 Use Mailchimp's Image + Caption block to add up to two captioned images to your campaign. Learn how to add, edit, and style Image + Caption blocks. Use Mailchimp's Image Group block to add up to five images to a section of an email.